The Peak Oil argument focuses on the question “How much oil?” We spend a lot of time discussing the exact inputs for Hubbert Linearization and projections of Ultimate Recoverable Reserves, in order to calculate the moment of Peak Oil. Sadly, the question of “How much oil?” is a lot more complicated than it seems. As I have said previously, theoretical discussions about oil reserves are pointless. In theory, the amount of oil available is an arbitrary number. Oil can be made from any organic source: coal, natural gas, biomass, or whatever. If enough energy is available, it can be made from CO2 and water. This applies to ALL resources. Minerals can be extracted from sea water if access to energy is unconstrained. Low quality is what is killing us, not low quantity. Alternately, we could argue that the constraint is low energy. If energy was cheap and unlimited, then recoverable resources would be unlimited. So we need to look at the availability of oil within a networked resource/energy extraction system, not just as an isolated resource. Resource constraints are about reserve QUALITY not reserve QUANTITY. The issue of quality exists within the context of an interconnected resource profit/loss system. The fact that the word “liquids” is now being used instead of oil is frankly inconvenient to people who fly the Peak Oil banner. We typically conflate the two words by issuing a hand-waving argument that amounts to “When oil peaks, liquids will peak”. But frankly this argument represents a chink in our armour – “unconventional oil” and all sorts of other non-oil liquids are now counted under the broad category of “liquids”. Synthetic and other manufactured liquids don’t fit neatly into our Hubbert Linearization model. In fact, they will invalidate the model until such time as we can prove (not deliver hand-waving argument, PROVE) that production of these liquids is limited, irrelevant, or correlated with oil production. What we need to prove is that there is a practical limit to production of synthetic “liquids”. Many factors impact on this practical limit. In my last post at The Oil Drum I looked at the interactions that would ultimately limit production. I’m not sure I can put a provable numeric limit on production. Nor can I put a provable date on the Production Peak for liquids. But I can show that we have evidence that these points are either close or past. Consider the situation here in Australia. We mine iron (and zinc, silver, aluminium, coal, NG, and lots of other stuff – but let’s stick to considering iron). Historically, it was quite possible to refine iron from very low quality sources. Vikings would smelt iron from a layer of iron-rich mud that got deposited as a layer in bogs and swamps. This was a very energy-intensive process and consequently a sword was an item of great value – passed down from father to son. However, when we started mining iron in Australia the ore was very pure. Steel could be made cheaply from our ore. As mining has continued in Australia we have consumed the high-quality ore and been forced to mine ores of lower quality – and even change to different types of ore.
At first this was not an issue. There is a simple mathematical reason for this. If ore drops 1% in quality, from 90% pure to 89% pure, then the increase in effort required to produce a given quantity of steel is negligible (around 1% extra energy required) – however the picture is very different at low ore qualities. If ore drops 1% in quality from 2% pure to 1% pure ore, then the amount of ore that must be processed to get the same amount of steel doubles. Consequently the energy required doubles (approximately). Energy consumption required to process the ore increases geometrically as ore quality drops. The energy required starts from almost negligible, initially rises very slowly, then passes through an inflection point, and from there rises at a frightening rate. How resource/energy requirements rise as resource quality declines. Note that the curve starts flat, then rises gradually, before starting to rise dramatically. – Not only is ore quality dropping, but the physical type of resource extracted is increasingly lower-quality (we are forced to accept ore of a different and inferior chemical or structural composition). This geometric increase in energy cost as quality declines is a well known relationship and not terribly controversial. However the consequence is dramatic. This raises an important question. How widespread is this phenomenon right now? 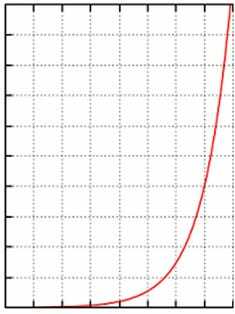 How far along the geometric curve are we? 1. Oil. We have gone from oil gushing from wells at energy returns of at least (estimated) 100:1 to oil that is manufactured by digging up tar-soaked sand and refining this using a series of energy and resource intensive processes for an energy return that is estimated to be in single digits. 2. Coal. When I was a boy at school we were taught that there were three main grades of coal: Anthracite, bituminous coal, and brown coal. Anthracite was the stuff we used and exported. Bituminous got used a bit inside Australia, but wasn’t worth exporting. Brown coal was useless waste that you dug through to get to better grades. But then, when I was a kid I was also taught that the population of Earth is 2.3 Billion people. The situation now is that Australia’s production of anthracite is declining. Even brown coal is mined and exported. 3. Iron. Australia used to export high-grade hematite ore (96% of iron ore exports). Those days are drawing to a close. We now increasingly mine and export a different kind of ore – Magnetite. Magnetite is a chemically different and lower-grade ore that must be processed to increase its grade before it is shipped. 4. Other industrial metals. Silver is an interesting metal. Despite a dramatic increase in price, demand continues to rise, driven as much by its value as an industrial metal as by its status as a precious metal. We are producing more of it every year here in Australia. 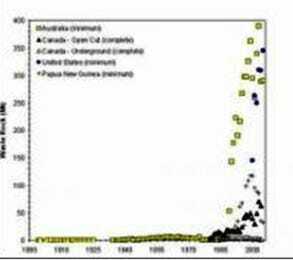 The attached graphic (of waste rock produced while mining silver) pretty much says it all. I think that tells us where we are on the curve doesn’t it? Obviously our exact position on the curve will vary, depending on the resource under examination, but the trend is clear. Further, as discussed previously resources tend to be somewhat networked in our intertwined society, and consequently impacts on one group of resources tend to resonate in others. So. To produce energy we are finding that we must invest a geometrically increasing amount of energy. Because of the increasing difficulty, we also need to invest a geometrically increasing amount of other resources (eg steel) which in turn requires a geometrically increasing amount of embedded energy to produce (mostly coal and oil). Obviously this gets us into a positive-feedback loop. We need more energy in order to produce more energy. 1. Historically our prosperity has been based on the fact that producing resources yielded more resources than it costs. This resource “profit” is a requirement for all other productivity. Our economy requires this profit. Ultimately, our society and our civilisation are built on the simple fact that during resource production, more energy and resources are produced than are consumed. If that simple fact was not true, we would be back in the stone ages. 2. However the cost (expressed in terms of energy and resources) to produce energy and resources (which was previously relatively flat) is starting to rise geometrically, and there are positive feedback effects in place. 3. This will result in less “net resources” for our society and this trend will continue to worsen geometrically. NOTE: My concern is that the progression is geometric. The problem is almost negligible until you hit the inflection point and then the curve goes vertical. This progression will end when the geometric curve reaches the inflection point and starts to go vertical – because at that point the diminishing returns from energy will rapidly lead to a resource squeeze that will cause our society to go through some marked changes. Economically recoverable resources in a good economy may be beyond the reach of a declining economy. – Increasing resource/commodity costs. Which we have seen. – Since money is a proxy for the net resource “profit”, if this “profit” starts to decline you would start to see financial problems. Which we have seen. – You would start to see graphs that “hockey stick” upwards. Such as the attached “waste rock.jpg”…. Which we have seen. It appears to me that, for a significant number of resources, we are at or past the inflection point. Eventually, in theory, the quantity of resources used in the extraction process will reach 100%. All of each given resource produced would, in theory, be consumed in the extraction process of other resources. Of course, this point cannot be reached because society is sustained by the net profitability of the system. Long before profitability declines to zero, the available produced resources will drop below the point where society can be sustained. In theory, society would cease, and production would cease. Of course the sudden cessation of society is also an unlikely scenario. The reality would more likely be a gradual and uneven process, with significant contention for high-quality resources. There would be winners and losers. Some of the Earth’s population would continue to live relatively well, utilising the remaining high-quality resources. Ideally, recognition of the problem and a focus on research would cause a new source of high-quality energy to emerge (candidates include breeder reactors, Thorium reactors, cold fusion, or some unexpected fundamental breakthrough). If this did not occur, the second law of thermodynamics would continue to exert its relentless effects. When examining the net efficiency of a resource system we find that we struggle to define profit/loss in meaningful terms because fungible “resource units” don’t exist. We can’t deduct a unit of steel and a unit of energy from 10 units of oil to establish net efficiency of a particular oil field. However economists bring us the (admittedly imperfect) concept of “utility”. Economics uses money as a (imperfect) proxy for utility. This gives us a layer of abstraction. Instead of using units of resources we can simply look at the monetary profitability of the oil field. This will usually be a good proxy for its profitability in resource terms. However this layer of abstraction has a downside. It can hide the underlying fact that our systemic resource “profit margin” is declining. Our monetary system was designed with a set of underlying assumptions. The system was designed to allow for the relatively constant expansion in GDP that nations have experienced. Money is constantly created to account for the constant expansion in GDP and the associated increase in available resources. The monetary system works well in times of expansion, but not so well in a contracting environment. Economics deals with scarcity of an isolated product by using price signals to encourage either increased production or substitution. An expanding base is assumed; in fact our entire monetary system is predicated on that assumption. In some ways, our system is based on a survival-of-the-fittest framework. The assumption is that the system is comprised of a series of products competing in an ever-expanding way. In the event of a shortage of an individual product the price signal will cause a “fitter” product to manifest from somewhere else in the system. This mechanism does not deal well with a widespread decrease in quality leading to an across-the-board increase in required inputs and a simultaneous across-the-board decrease in returns. This combination drives up the price of everything, thus causing the loss of the “price signal”. Our monetary system offers no meaningful signal to tell us what the problem is, and no useful mechanism for offering a solution. Clearly, this is a basic flaw in the system that we are using as a proxy for our resource profit/loss. Our monetary system abstracts us away from the problem, and provides us with no direct mechanism for observing it. In an expanding environment, this is not a problem, but if we have passed the inflection point then it is possible that our gross “resources extracted” is expanding, but our net “resources available” is declining (or approaching this point). If this is the case, then we are in a situation that our monetary system was not designed for – a systemic contraction in available resources. If money is a proxy for “resources available” then money has to go through some form of contraction or change in order to cope with a contraction in resources available – a situation hitherto unprecedented in our experience. Systemic contractions in the monetary system do, of course, occur – they are called recessions and depressions. It may not be coincidental that the world is suffering from an unprecedented mix of recessions and economic turmoil right now. 1. Initially we might not be able to see the problem. In theory money gets lent into existence at a rate that matches our expanding GDP, and GDP is correlated to a consumption of resources and energy. Since money is lent into existence, our leaders interpret a lack of ready money supply as a “credit squeeze”. They would be unlikely to view a decrease in money supply as an accurate reflection of a decrease in “resources available” – this simply doesn’t happen. It would go unrecognised. If the “profit margin” in energy and resources declines, then “resources available” declines and GDP should decline. However, this is bad for the economy, so if the underlying cause is not recognised then the GDP might be artificially maintained for some time by injecting more of the resource “proxy” – money – into the economy in an effort to address the assumed “credit squeeze”. This money would have to go somewhere. In the absence of resources available to create concrete products this might result in the creation of phantom products that do not require any significant resources – products such as Collateralized Debt Obligations and Structured Investment Vehicles. This increase in the supply of the proxy without increasing the supply of the resources that underlie the proxy cannot, of course, solve the problem. This would lead to economic turmoil as the system “corrected”. No amount of injected money will help. QE2, QE3, and every variation on TARP and stimulus spending will not help. Money is just a proxy for the problem, it is not the problem. 2. Similarly, using money as a proxy for resource extraction profit will mean that those who work in the mining industry will not initially see that they have an underlying structural problem. In their view, although the resource quality is declining, they still have plenty of their lower-quality resource. The problem is that the price paid for all the resources that they use in the extraction process are going up. So even though the price they get paid for their resource is going up, their costs are going up faster. Although a decline in available resources should lead to an economic contraction, we have seen that central banks in numerous countries have tried to reverse this contraction by injecting money into the economy. This money should support a continued spiralling increase in resource costs, with each resource cost increase feeding into the increased costs of other resources. We could further speculate that this spiralling increase should stop shortly after the injections of liquidity stop. Sadly, production is likely to start dropping shortly after that. The use of money as an abstracted proxy for resources can temporarily hide an underlying structural issue if the issue is one that can’t be signalled or solved with money. 1. In theory we can make arbitrary amounts of oil. So we have near-infinite quantities. 2. In practice, at some point (probably within the next few decades) we will find that we can not even produce all the oil that is currently listed as “reserves” because this stuff is going to take more energy and resources to produce than we have readily available. Some of this oil may be produced gradually, in coming decades, but not at any significant production rate. The rest will stay as a reserve that is not commercially recoverable in a declining economic environment. Some of the really “hard oil” may never be produced because the economy may not be able to put together the prodigious combination of energy and resources necessary to find and produce oil in impossibly difficult locations. Oil and resources that are economically recoverable today may not be economically recoverable if the economy declines. Discussions of Hubbert Linearization to produce URR and from there project an exact date for Peak Oil are interesting but no longer relevant. This problem is insoluble because we keep on finding new “oil”, or rather redefining what “oil” is. Concentrating on one measure of one resource in isolation is pointless. It must be considered in terms of the overall “profit” of the resource system. If we had no other problems in the system, we could keep finding new oil (by redefining what we mean by “oil”) and produce oil endlessly. However, even though we can keep on finding new “oil,” this oil is low-quality and when considered within the context of our overall system, low quality (low profit) is what will kill us, not unavailability. If it were just low-quality oil, we could live with it, because producing oil from low quality sources is no problem as long as we have access to a source of high quality energy (i.e. a highly “profitable” resource). But viewed within the context of the system we see the problem – we have declining access to all forms of high-quality energy. Instead we have the compounding problems of increasingly low-quality ores which require increasingly large amounts of energy to refine. It is a problem of quality not quantity and it is a problem that must be seen within the context of a system, not in isolation. The problem presents itself in the form of a declining economy but the underlying issue is that declining resource quality is reducing our resource “profit” and squeezing us at the economic margins. 1. Resource constraints are about reserve QUALITY not reserve QUANTITY. The issue of quality only exists within the context of an interconnected resource profit/loss system. 2. Resources that are hard to get, but economically recoverable by a strong economy, may be beyond the reach of a declining economy. 3. The use of money as an abstracted proxy for the profit/loss of the resource extraction system can temporarily hide underlying structural issues if the issues can’t be signaled or solved with money.